This award-winning, regionally best-selling cookbook is flat-out gorgeous. And the food is amazing, too. Author Susan Campoy spent thirty years as one of Los Angeles' most in-demand caterers, and her Julienne bistro in San Marino hasn't had an empty seat in two decades. 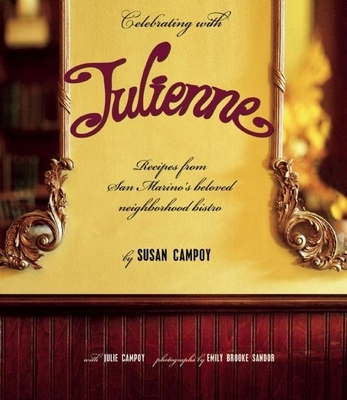 Completed just before Campoy died of breast cancer in 2009, Celebrating with Julienne showcases the most beloved recipes from her career: Cr me Br l e French Toast, Carrot Ginger Soup, Beef Daube, Lemon Coconut Bars, and so much more, including holiday, party, and picnic menus. All royalties go to City of Hope.